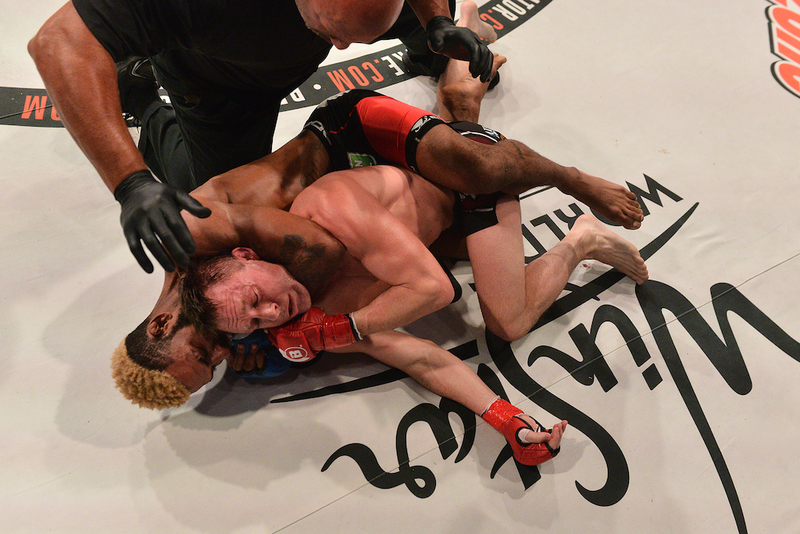 THACKERVILLE, OK. (March 4, 2016) – It’s safe to say Darrion Caldwell (9-0) asserted himself as a legitimate title contender with his victory over Joe Warren (13-5) in the main event of “Bellator 151: Warren vs. Caldwell” on Friday night in front of a sold-out crowd at WinStar Resort and Casino. As many expected, the fight quickly made it to the mat, with “The Wolf” taking down the self-proclaimed “Baddest Man on the Planet” and initiating a sequence of ground-and-pound offense. After Warren made it back to his feet, the former NC State wrestler suplexed Warren and sunk in a rear-naked choke — that Warren refused to tap to — forcing referee Dan Miragliotta to wave off the bout at 3:23 of round one. Following the technical submission victory, Caldwell made good use of his time on the microphone with color commentator Jimmy Smith, calling out current bantamweight champion Marcos Galvao, simply saying: “F*ck you [Marcos] Galvao, you’re a p*ssy.” That’s nine straight victories for the former NCAA Champion to begin his mixed martial arts career, three wins since making the transition from featherweight to bantamweight. Meanwhile, Warren has now dropped two out of three and will not get a shot at the winner of Galvao and Eduardo Dantas when they do finally meet. In the co-main event of the evening, Fernando Gonzalez (25-13) extended his winning streak to five at the expense of Gilbert Smith (12-5), taking home a split decision win (29-28, 28-29, 29-28). The takedowns were likely the difference on the judges’ scorecards, but both fighters had their moments over the course of 15 minutes. Gonzalez now moves even closer to a shot at the 170-pound title, or a matchup with Michael Page, who was originally slated to face “The Menifee Maniac” before withdrawing. The future of the division will be much clearer following “Bellator 153: Koreshkov vs. Henderson” April 22, when Benson Henderson challenges Andrey Koreshkov for the welterweight belt. Goiti Yamauchi (19-3) came into his fight against Bubba Jenkins (11-2) riding a wave of momentum after three-straight wins, but the Arizona State wrestling standout used his world-class grappling to neutralize the striking and jiu-jitsu prowess of Yamauchi. The 23-year-old Japanese competitor took the back of Jenkins for the duration of round one and nearly secured an arm bar late in the final round, but “The Highlight Kid’s” effective grappling was the difference, earning the unanimous decision (29-28, 30-27, 29-27). Jenkins now has won three consecutive fights since his January 2015 loss to Georgi Karakhanyan. During the opening main card contest at “Bellator 151: Warren vs. Caldwell,” Sirwan Kakai (12-4) dropped his first fight under the Bellator MMA banner to Joe Taimanglo (22-6-1) via unanimous decision (29-28, 29-28, 29-28). It looked as though “Baby Joe” was going to finish the contest early — sinking in an Anaconda Choke before transitioning to a deep guillotine — but “Zohan” weathered the storm and hung around for the final ten minutes, even creating some bright spots of his own in the third and final round. In the end, the judges’ cage side awarded the Guam-native his third consecutive victory and sent Kakai back to the drawing board.